The Burke Library is happy to announce the processing and availability of the GEE Lindquist Papers, 1897-1955, part of MRL10: North America! Please see the finding aid HERE. Gustavus Elmer Emanuel Lindquist was a prominent figure in twentieth-century Protestant missions among Native Americans and an active member of Home Missions Council of the Federal Council of Churches. A full biography on the life of Lindquist can be seen on the Finding Aid. The collection was originally organized in its original order as organized by the Missionary Research Library. In October 2012 the collection was entirely reprocessed and the organization was overhauled by Brigette C. Kamsler as part of the Luce Foundation grant. The collection is organized in two parts: boxes 1-34 consist of paper documents and writings and boxes 35-66 are the photographic materials. The contents of Boxes 35-66 are digitized and available on line at http://lindquist.cul.columbia.edu/. The collection consists of correspondence, reports, government publications, committee minutes, papers, surveys, conference materials, articles, newspaper and journal clippings, articles or manuscripts by Lindquist, postcards, booklets, questionnaires, pamphlets, maps, photographs, and lantern slides. Dates are provided when they are known. Letter from M. K. Sniffer to Lindquist, April 25, 1920.
Credit to MRL 10: Lindquist Papers, series 1, box 1, folder 3, The Burke Library Archives, Columbia University Libraries, at Union Theological Seminary, New York. Organizations represented include but are not limited to schools, such as the Fort Mojave Indian School, the Charles H. Cook Christian Training School, an interdenominational Christian training center for Indians, and the Pawnee Indian Boarding School; the National War Work Council of the YMCA, the Interchurch World Movement, The American Indian Defense Association, The Federation of Protestant Activities, and the Roe Indian Institute; churches, both national such as the Reformed Church in America, Presbyterian and Congregational churches, and local entities including the Chemawa Campus Church. Lindquist also corresponded with a number of well-known individuals, such as Hubert Work, secretary of the interior and Stephen E. Keeler, bishop of Minnesota. Letter from Henry Roe Cloud to Lindquist, May 13, 1919.
Credit to MRL 10: Lindquist Papers, series 1, box 1, folder 2, The Burke Library Archives, Columbia University Libraries, at Union Theological Seminary, New York. Series 2 pertains to Lindquist’s personal writings and publications from 1912-1954. The material is organized alphabetically by the title of the article and come from published magazines as well as manuscript or typescript, some of which was noted as not for publication. Also incorporated with some articles are the draft versions by Lindquist, including his corrections, and the final published version. Series 3 consists of 8 boxes of records pertaining to specific Native American tribes and reservations that Lindquist worked with and studied, including the Navajo, Hopi, and Apache, from 1900-1954. Lindquist also kept separate files on the drug peyote; this section has been left in series 3 as Lindquist intended because of its intrinsic value to the culture of many tribes. The large amount of material is organized geographically by state, and includes other countries such as Canada, Mexico and South America. 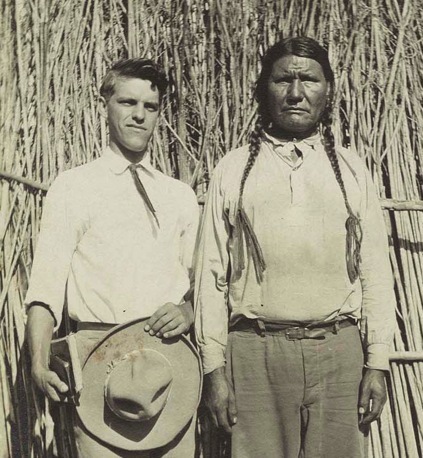 Series 4, Missions from 1897-1955, contains mission-specific and religious material, as well as records from organizations that were involved with missions to the Native Americans. The Home Missions Council (HMC) material contains Annual Reports, Survey of Home Mission Agencies and other administrative records including conferences, meetings, and seminars. The Joint Committee for Indian Work was a combination of HMC and Council of Women for Home Missions (CWHM). The series also contains detailed Indian survey information, including that from the Interchurch World Movement, of which Lindquist was director. 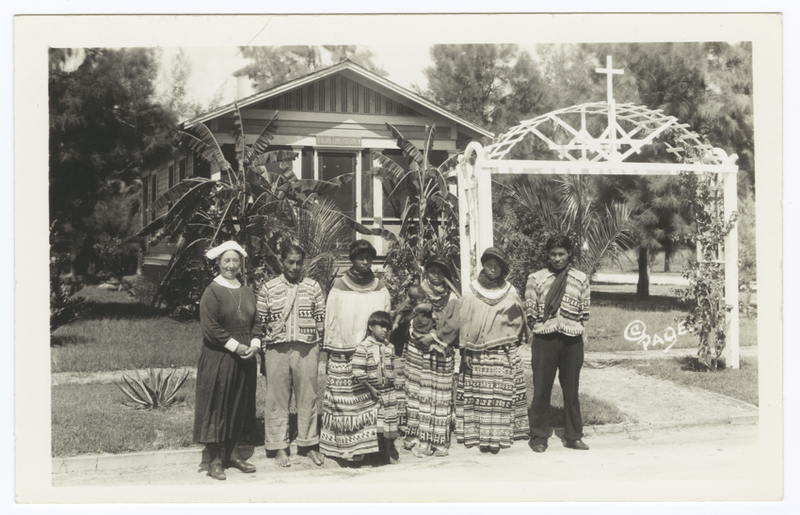 Deaconess Bedell and Seminole Indians Outside the Glade Cross Mission Headquarters, 1912-1953.
Credit to MRL 10: Lindquist Papers, series 8A, box 38, item 723, The Burke Library Archives, Columbia University Libraries, at Union Theological Seminary, New York. Education, 1915-1953, fills Series 5, and pertains mainly to Native American schools. The series also offers information on non-religious schools, and the Home Missions Literature Program. Series 6 spanning 1912-1953 contains government affairs and includes information on general topics as well as specific departments within the government. Conferences, committees, proposed legislation, Indian migration and freedom of religion are some of the topics covered. Other items of note contain records relating to “wardship,” the Wheeler-Howard Act, and a handwritten notebook kept by Lindquist detailing Native Americans serving during World War One and World War Two. Specific departmental information in the series is from the Department of the Interior, the Office of Indian Affairs, the Board of Indian Commissioners, and finally the National Fellowship of Indian workers. The section on National Fellowship of Indian Workers details information on the organization, which was formed to promote the interest of missionaries and all those engaged in the education and civilization of Native Americans. 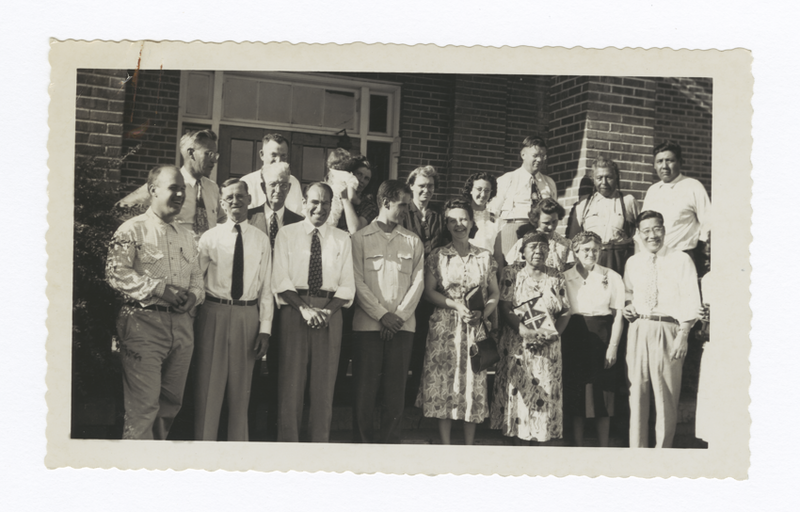 National Fellowship of Indian Workers, Group of Conference Attendees in front of a Brick Building, 1942-1951.
Credit to MRL 10: Lindquist Papers, series 8A, box OS, item 1833, The Burke Library Archives, Columbia University Libraries, at Union Theological Seminary, New York. The final series in the first section of the Lindquist material contain source files. Series 7 spans 1912-1953 and offers general materials outside of missions, tribes and government/educational affairs, and appears to be files that Lindquist kept for information on specific topics. Topics include Indians and health, athletics, ethnology and home life. Series 8 is restricted due to the fragile nature of the material. However the large selection of original photographs, negatives, and postcards collected and taken by Lindquist during his work is available through this wonderful website http://lindquist.cul.columbia.edu/. A wide range of states and locations are depicted, including in the United States as well as Mexico and Canada. Photographs include individual portraits, landscapes, group images, buildings such as churches, private residences and schools, agricultural and industrial scenes, leisure activities and other events and living conditions experienced by a variety of Native communities. The maps are currently unavailable at this time while they undergo conservation treatment. Please come by soon to conduct research with the Lindquist Papers! This entry was posted in Collections and tagged Indian, Indians, Lindquist, MRL, MRL10, Native American, Native Americans, North America, Reservations, Tribes on November 12, 2012 by Brigette C. Kamsler.